Product Dimensions (L x W x H): 19" x 7" x 18"
Our San Felipe model has a dimension of 19 x 7 x 18. It is a smaller scale version of a much larger version such as the San Felipe 36 and the 56. Our model is handcrafted from beautiful wood such as rosewood, mahogany, teak, and along with various other exotic wood. The hull is constructed using a plank on frame method, each strip of exotic wood are carefully join together to form a smooth hull. This model is completely hand built to spec by skillful and creative master craftsmen; you will be amazed at how real it looks. 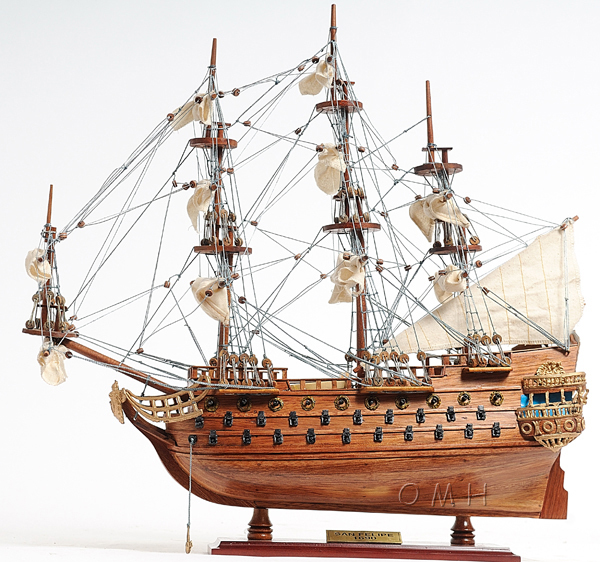 The ship has a clear varnished coating follow with amazing details. On the ship, you will spot amazing details such as: wooden bowsprit, foremast, mainmast, and mizzen mast. They are all connected to numerous fabric sails with detailed stitching, all rigging are painstakingly fastened by hand in matching colors. Theres a small wooden cabin with a wooden boat on the main deck. On the quarter deck, theres a wooden cabin. There are wooden railings surrounding the beakdeck area toward the quarter deck area. You can easily spot 3 long rows of metal cannons on both side of the hull, and other crafted metal parts on the front and back of the ship. Theres also a wooden rudder to help the ship maneuver in the right direction. An attached wooden stand with a nameplate engraved San Felipe 1690 is standard on this model. Our model was built according to scale through original plans, pictures and drawings. We absolutely use no plastic parts only the highest quality wood and metal parts. This model is carefully secure and packed inside a wooden crate for easy shipping purposes. Our San Felipe model comes fully-assembled and ready to be display. The San Felipe, launched in 1690, was one of the most beautiful Spanish galleons of the XVII century. She was the lead ship of the famous Spanish Armada. The San Felipe displaced more than 1000 tons and was armed with 96 cannons, enabling her to take on the most formidable ships in the French and British navies. The San Felipe's role in the war against the British and French was to help protect Spanish settlements and harbors, to transport treasures, and to safeguard the long and hazardous passage back to Spanish ports. In 1705, the San Felipe participated in a furious and heroic battle between 12 Spanish ships and 35 British ships. After 24 hours of battle, she was captured by an English ship, but was so badly damaged that she could not be salvaged as a prize. She went down to the bottom of the ocean with several tons of gold.